This volume highlights aspects and approaches to questions on the development and findings of biotic indicator (systems), considering the complex problems of conversion into practice. Biotic indication in relation to sustainable land use and biodiversity is discussed from many angles. Conceptions and models to show the economic effects and possibilities of practical application of such indicators. Part I. Introduction. 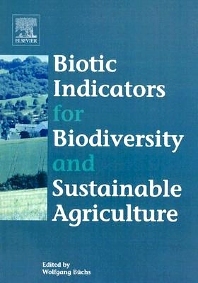 Biotic indicators for biodiversity and sustainable agriculture - introduction and background (W. Büchs). Part II. Requirements. Environmental policy, agri-environmental indicators and landscape indicators (H.-P. Piorr). Part III. Biodiversity at different scale levels. Biodiversity and agri-environmental indicators - general scopes and skills with special reference to the habitat level (W. Büchs). Floristic diversity at the habitat scale in agricultural landscapes of Central Europe - summary, conclusions and perspectives (R. Waldhardt, D. Simmering, H. Albrecht). Biodiversity indicators: the choice of values and measures (P. Duelli, M.K. Obrist). Biodiversity, the ultimate agri-environmental indicator? : Potential and limits for the application of faunistic elements as gradual indicators in agroecosystems (W. Büchs, A. Harenberg et al.). Sample size and quality of indication - a case study using ground-dwelling arthropods as indicators in agricultural ecosystems (J. Perner). Biotic indicators of carabid species richness on organically and conventionally managed arable fields (T.F. Döring, A. Hiller et al.). The spatial and temporal pattern of carabid beetles on arable fields in northern Germany (Schleswig-Holstein) and their value as ecological indicators (U. Irmler). Which carabid species benefit from organic agriculture? - A review of comparative studies in winter cereals from Germany and Switzerland (T.F. Döring, B. Kromp). Regional diversity of temporary wetland carabid beetle communities: a matter of landscape features or cultivation intensity? (U. Brose). Assessment of changing agricultural land use: response of vegetation, ground-dwelling spiders and beetles to the conversion of arable land into grassland (J. Perner, S. Malt). Auchenorrhyncha communities as indicators of disturbance in grasslands (Insecta, Hemiptera) - a case study from the Elbe flood plains (northern Germany) (H. Nickel, J. Hildebrandt). Suitability of arable weeds as indicator organisms to evaluate species conservation effects of management in agricultural ecosystems (H. Albrecht). Morphometric parameters: an approach for the indication of environmental conditions on calcareous grassland (C. Mückschel, A. Otte). Selecting target species to evaluate the success of wet grassland restoration (G. Rosenthal). Development and control of weeds in arable farming systems (B. Gerowitt). Indicators for evaluating soil quality (M. Schloter, O. Dilly, J.C. Munch). A biological classification concept for the assessment of soil quality: "biological soil classification scheme" (BBSK) (A. Ruf, L. Beck et al.). On the quality of soil biodiversity indicators: abiotic and biotic parameters as predictors of soil faunal richness at different spatial scales (K. Ekschmitt, T. Stierhof et al.). Microbial eco-physiological indicators to asses soil quality (T.-H. Anderson). Influence of precision farming on the microbial community structure and functions in nitrogen turnover (M. Schloter, H.-J. Bach et al.). Biodiversity and landscape - summary, conclusions and perspectives (R. Waldhardt). Quantifying the impact of landscape and habitat features on biodiversity in cultivated landscapes (Ph. Jeanneret, B. Schüpbach, H. Luka). Landscape structure as an indicator of biodiversity: matrix effects on species richness (J. Dauber, M. Hirsch et al.). The influence of matrix type on flower visitors of Centaurea jacea L. (M. Hirsch, S. Pfaff, V. Wolters). Indicators of plant species and community diversity in grasslands (R. Waldhardt, A. Otte). Effects of landscape patterns on species richness - a modelling approach (N.C. Steiner, W. Köhler). Landscape indicators from ecological area sampling in Germany (R. Hoffmann-Kroll, D. Schäfer, S. Seibel). Operationalisation of a landscape-oriented indicator (E. Osinski). Mosaic indicators - theoretical approach for the development of indicators for species diversity in agricultural landscapes (J. Hoffmann, J.M. Greef). Practical example of the mosaic indicators approach (J. Hoffmann, J.M. Greef et al.). Part IV. Experiences and applications. Application of biotic indicators for evaluation of sustainable land use - current procedures and future developments (E. Osinski, U. Meier et al.). Bio-resource evaluation within agri-environmental assessment tools in different European countries (D. Braband, U. Geier, U. Köpke). Method for assessing the proportion of ecologically, culturally and provincially significant areas (OELF) in agrarian spaces used as a criterion for environmental friendly agriculture (D. Roth, M. Schwabe). Experiences with the application, recordation and valuation of agri-environmental indicators in agricultural practice (M. Menge). Field related organisms as possible indicators for evaluation of land use intensity (W. Heyer, K.-J. Hülsbergen et al.). Nature balance scheme for farms - evaluation of the ecological situation (R. Oppermann). Part V. Economy. Economic perspectives of using indicators (E. Osinski, J. Kantelhardt, A. Heissenhuber). Money as an indicator: to make use of economic evaluation for biodiversity conservation (I. Bräuer). Threshold values for nature protection areas as indicators for bio-diversity - a regional evaluation of economic and ecological consequences (S. Herrmann, S. Dabbert, H.-G. Schwarz-von Raumer). Comparative assessment of agri-environment programmes in federal states of Germany (R. Marggraf). Is there a reliable correlation between hedgerow density and agricultural site conditions? (J. Kantelhardt, E. Osinski, A. Heissenhuber). Consideration of biotic nature conservation targets in agricultural land use - a case study from the Biosphere Reserve Schorfheide-Chorin (A. Meyer-Aurich, P. Zander, M. Hermann). Rewards for ecological goods - requirements and perspectives for agricultural land use (B. Gerowitt, J. Isselstein, R. Marggraf). Author Index. Subject Index. Volume Contents. Editorial Advisory Board.